A shiny gold holiday party invitation -- perfect for business or personal holiday parties. Assembly Required. Easy to personalize and decorate. Very stylish with a special, matching gold envelope. 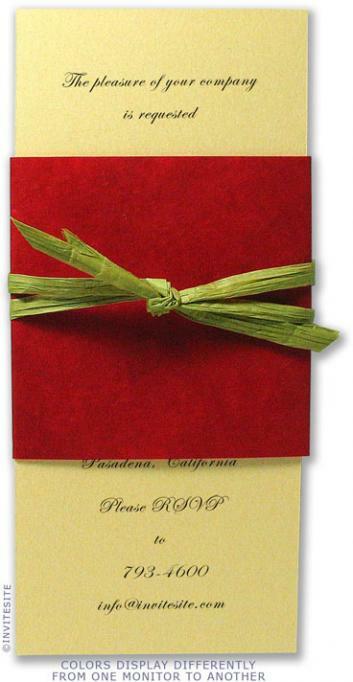 Simple long and elegant invitation with a red handmade paper bellyband, tied off with sage green paper raffia. Kit includes a matching gold #10 envelope. Papers are imported from Italy, bellyband is handmade Lokta paper from Nepal. Invite Sheet: Gold Italian pearlescent cardstock 105 lb. Mailing Envelope: Matching gold pearlescent #10 size envelope.